The Photo below was submitted by Lois Simard (nee Flake), daughter of Percy Flake, who worked in the Coal Mines in Bienfait. 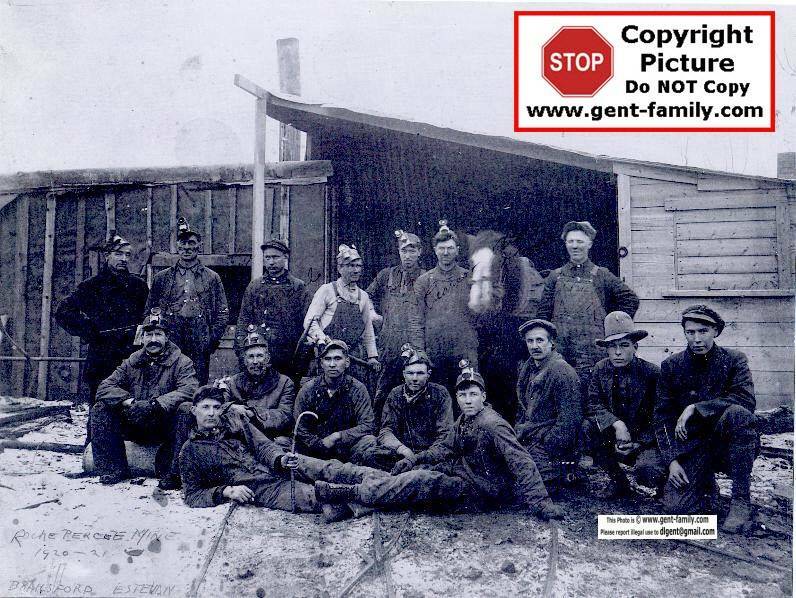 Leander Langen, (#7 in the picture below), was an Uncle of her Mother, Agnes Flake (nee Langen). Thanks again Lois! The sad part is this picture has names written on it, but in such faint form, no computer tricks I know, have been able to bring them out totally. I have made some guesses, and maybe this might help someone identify them. Lying in front, L-R- Unknown #15, Unknown, ends in ly #16. From MaryRose Boyer comes this little interesting local history story, which she has given me permission to add here. I believe I have one name for you for that photo—#14 is most likely Louis Gardipie, sometimes spelled Garipie. He never married but lived with a very dear lady named Tillie Friesen when I knew them. His father was most likely George Garipie who had something to do with managing a supply post used by travellers & the NWMP in the mid to late 1800s. Louis always wore a hat in the manner of the photo to cover a growth that grew bigger as he aged. He was a friendly man from what I remember. He was the brother of Agnes Blondeau (Fred), Mrs. McKersie and Mrs. Jardine. Louis lived to be quite an age and made his home in later years in Bienfait. When my family would visit them, they lived just across the Souris R. from where Lorne Jahn now lives. The Garipie name & 1810 is carved on the rocks north of Clarence Jahn's home outside of Roche Percee. It is an old name for this area. Louis may have descended as many of us long-time Metis residents of this area did from the Metis scouts & guides known as the 49th Rangers. As you probably know, they accompanied the Boundary Commission and to a lesser extent the NWMP as they travelled out here to do their tasks. Garipies would also have been involved in the fur trade & buffalo hunts I gather. Louis Gardipie (Gardippe in 1921 census) age 65 in 1921, born in SK. The Blondeaus in the photo are most likely sons of my great grandfather Louis Blondeau who homesteaded on land directly south of Estevan near where a u-pick berry farm is now. Louis & his wife, Mary Robillard, were parents of about 18 children. By the time I arrived in the mid 40s, I knew of my grandfather, Reuben, and his 5 brothers–Jack, Bill, Joe, Fred, Alex some of whom I know worked for mines. There was another Blondeau family in Estevan who had mine connections & that was the Samson Blondeau family. Sam & his wife Sarah had a son Tony who was killed in WW II. He may have been too young for this photo but perhaps his dad was one of the Blondeaus. Just for fun info–One of Louis Blondeau daughters, Marceline, married Albert Lajimodiere and were long-time residents of Estevan. Albert's father, Modeste, was a second cousin to Louis Riel who apparently was the best man at Modeste's wedding. As you can see this is a mystery, who most of these men are. Can you help? Just send me the man's #, 1-16 and who he is, First and Last name if known, and a bio if you know it also. My Uncle Frank Olson worked for Roche Percee Coal Mine Co.